The HVB Tower in Arabellapark, Munich, also known as the Hypo-Hochhaus, is one of the city’s characteristic buildings from the late 1970s and early ‘80s. It is one of the Bavarian capital’s defining landmarks, or as the general curator of the Bavarian State Office for Monument Conservation says: "The Hypo-Hochhaus shapes the Munich skyline. Anyone who sees it knows they are in Munich." At the same time, skyscrapers are a very sensitive issue in Munich. For once, however, the current debate is not about the height, but about the renovation of the114-metre tall building building, which is taller than the Frauenkirche. The Munich architectural firm Betz originally designed the building, and now serves as a consultant to the renovation project. This will ensure the preservation of the external characteristics of the high-rise, which was listed in 2006, and the subsequently constructed low-rise building. Henn Architekten is responsible for the planning and construction management, with Drees & Sommer managing the project. The building’s control systems, lighting, heating and air conditioning are being completely renovated and there is a new technical supply concept. The tower’s façade is to be reconditioned by the end of 2015, with all renovation measures for the high-rise and adjacent low-rise building to be completed in two phases by 2019. A total investment of around 250 million euros is currently estimated for the measures. HVB Immobilien AG is lead-managing the project. 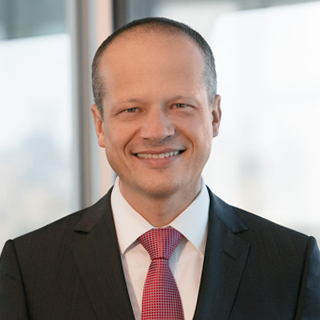 In the interview, HVB Immobilien CEO Peter Weidenhöfer reveals details about the skyscraper’s complete refurbishment, and explains how the issue of the listed façade will be handled. 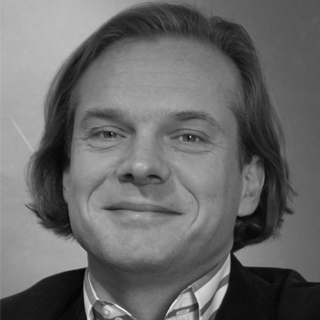 Mr. Weidenhöfer, what is the primary objective of the renovation? On our part, there is no single overriding objective – the issues of space efficiency, cost effectiveness, the protection of historic buildings and sustainability are all to be addressed simultaneously. Besides improving efficiency, we’re also focusing on reducing CO2. We are taking a holistic approach in our planning, so we don’t want to give priority to the issue of sustainability or green building certification over convenience and monument conservation, or vice versa. Nor should efficiency or – to put it bluntly – the aim of accommodating as many employees as possible in the given space, be the guiding principle. Rather, we are striving to create a high-quality work environment that is in harmony with the other objectives, in order to ensure the building’s overall flexible usability and long-term operational reliability. Will there be a new office concept as part of the redevelopment, and what it will look like? The former interior layout no longer meets present and future requirements, and the internal heat loads have changed due to the IT equipment. So the floor space will be used more efficiently in future, and will be adapted to the requirements of modern communications technology. We’re already testing the innovative 'smart working' office concept at one of our Tucherpark buildings in Munich, and will include the experience gained from this pilot project in the new concept. What is the structure of the new façade? The current façade is a single shell, and the windows cannot be opened. After the renovation, a double-skin façade will offer the option of natural ventilation. The inner windows will be tilt-able. The tilt mechanism is supported by a motor, so that the windows can be individually opened as well as centrally controlled. For design reasons, the outer shell will look almost identical to the original and therefore no natural ventilation will be all but invisible on the outside, so as to comply with the monument conservation requirements. As this is not a full-screen glass façade, the air adjacent to the areas of the currently closed plates can be sucked in through small holes that are barely noticeable from a distance, and there is no significant visual impairment since the façade is structured and scaly anyway. The closed silvery panels and reflective windows will continue to generate interesting light situations especially in the evening, and the building will take on the colour of the sky. The space between the façades will not be accessible, so that no interior space is lost. Moreover, the double skin must be developed towards the inside, as an exterior development is not possible for monument conservation reasons. The connections for the ventilation and cooling ceiling result from the inner form and the technical data of the facade. What is certain is that parts of the old facade can be reused in as far as it is economically feasible, with certain panels able to be reused 1:1 after cleaning. We won’t be able to repurpose the glass and the frames, but it may be possible to recycle some of them. What design and technology are you using for protection from sunlight?Aside from the monument conservation-related considerations, the venetian blinds- system will not be on the outside due to the high wind speeds around the tall building. In addition, we don’t want the heat to reach the inside of the building to begin with. The sun protection will be located inside the double façade. In simulations, the gaps between the two panes and the ventilation cross sections were reviewed and mock-ups were prepared. Will the building be certified and, if so, what will be its certification? The HVB-Tower will get a LEED certification. We expect to score very high in the awards ranking, however this is not a dominant objective in the project. As I mentioned earlier, sustainability should be balanced with other criteria such as cost effectiveness, efficiency and monument conservation. The redevelopment of the HVB Tower is an uncommon architectural challenge, as the project involves the renovation of an urban landmark. HVB Tower is a sculpture, a one-of-a-kind building whose design and appearance are still fascinating to this day. The 'dematerialization' effect of the building originally intended by the architects Betz in the design of the façade is part of its uniqueness. From an urban development point of view, HVB Tower – as can be easily seen on panoramic photos – is a formative feature in the Munich skyline. Since its completion and inauguration in 1981, the Tower has undergone a number of transformations: small and large renovations were made, of which the largest was probably the conversion of the retail centre in the north low-rise building, which took two years from 1998 to 2000. The complete renovation of the casino and the south low-rise building in 2001 was the last major action before the building was listed as a protected momument in 2006. So for the architectural firm HENN, the starting situation in the renovation of the tower was a building whose interior, unlike the external façade, was no longer in the original condition. The challenge now consisted of analysing which areas of the building’s interior are worthy of preserving for the purposes of historic conservation. The results showed that due to the earlier conversions hardly any original material from the time it was erected was left and consequently there was greater room for reinterpretation. This freedom is being used to do justice to the high aesthetic standards of the building, with a subtle interior design – developed from the building shell and its design principles – that also meets the requirements for its future use as the seat of the Executive Board. Meanwhile, the historic preservation requirements for the façade were clearly identified from the outset: the renovation would have to revolve around retaining all the design and visual characteristics of the façade shell. The real challenge in the planning process was to reconcile this with the new, modern requirements the façade has to meet. Right from the start – practically since HVB Immobilien AG placed the order and while drafting the first design concepts – HENN and the client/developer entered into an intensive dialogue with the conservation authorities and with Oliver Betz, the representative of the original architects. Only in this close dialogue was it possible to develop a building-specific and future-proof façade concept that guaranteed the functional and physical construction requirements of a modern skyscraper façade while keeping its appearance identical with the existing façade, and thereby considered the concerns of all stakeholders to the greatest possible extent. 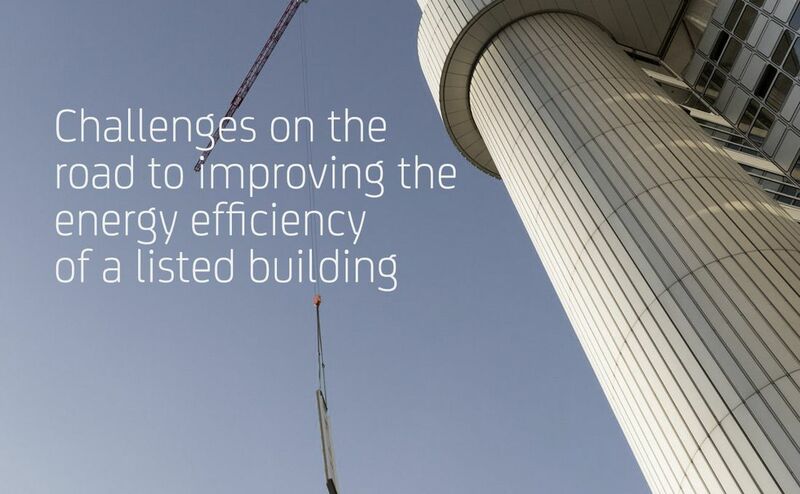 Within this extensive project, the energy-efficient renovation of the façade is one of the most important measures because it is prerequisite to realising a modern climate control concept with maximum user comfort and convenience. The sheet metal panels of the existing façade itself are professionally cleaned and reused for reasons of monument preservation as well as to minimise resource consumption. The supporting structure, insulation and glass panes are completely new. Until now the façade consisted of single-shell elements with double glazing units, which are now being replaced with double-shell elements (box window design principle). The inner layer of the elements is triple glazed. Barely perceptible perforations in the façade elements allow outside air to enter the box window space and if necessary continue on inside as fresh air into the offices through openable windows. 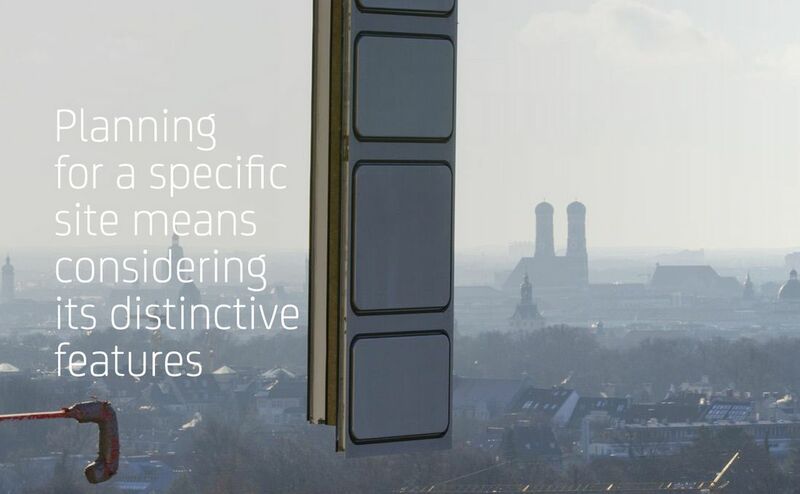 In future the box windows will contain sun protection – another technical innovation in the construction of the façade. Protected from wind or weather conditions by the outer deflector pane, this sunscreen ensures a significant reduction in external heat loads, thereby enabling the building systems to be upgraded to a more future-proof status. The proposed heating-and-cooling ceilings represent an investment in a modern climate-control concept that is energy efficient as well as providing the best possible user comfort. The sun protection also serves to protect the workstations from glare. Along with the heritage authorities, the fire brigade and the local building committee have been close dialogue partners for all planners responsible for the project since planning began. As HVB Tower is a skyscraper, its fire protection was designed in accordance with the high-rise directive and in consultation with the authorities. A fire protection concept was jointly developed – based on the existing supporting structure – that represents a significant improvement and ensures the [building’s] long-term operational safety. The tower’s existing staircases will serve as pressure-vented safety stairwells in future. In the event of fire, fresh air would be blown into all four stairwells so that they remain free of smoke and enable a safe evacuation. During its integration into the planning the complexity of this system influenced the structuring of the entire building, because the excess pressure generated by the air blown in must escape in a controlled way again through the building shell. In addition, among other things, a full sprinkling system and full-scale monitoring by a fire detection system will ensure maximum safety. By optimising the internal structure of the floors for fire protection purposes, maximum flexibility in office space structure was achieved without compromising fire protection objectives, which follows the original design concept from when the building was erected as well as meeting today's needs and aspirations. An appropriate quality of design and materials is critical to the future interior of the storeys. Future, progress, timelessness, quality and design are the visual messages communicated to us by the building exterior. This claim must be clearly followed up on the inside of the building for everyone to see, thereby creating a unity between its outdoor and indoor spaces. The spatial reinterpretation is based on the principles of the original design, which were ultra-modern in the 1970s: a flexible and future-oriented office space structure that is adaptable to changing office workflows. This was the original intent and is now being planned for as well. 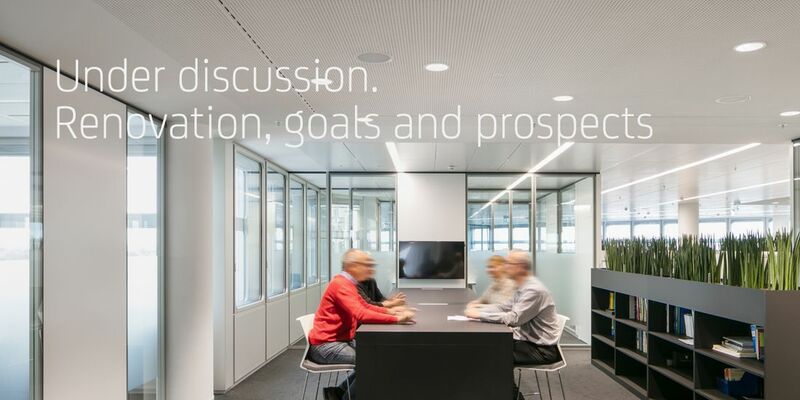 Both individual offices and multi-office landscapes are possible and, thanks to the shape of the building, the rooms are always well lit and have glorious views from this spectacular architectural monument and landmark of Munich. Planning for a specific site means thinking about the distinctive. This aphorism, which (in German) was also the title of a book about the architecture firm Betz Architekten (1), could not be more aptly worded. It reflects the philosophy and mission that each new commission means for the firm: to find that special distinctive something, and then translate it into architecture. In 1969, when the competition to build the new headquarters for the then Hypo-Bank was put out to tender, the initial result of this thought process looked nothing like the tower block that dominates Munich’s skyline to this day. Walther and Bea Betz won the competition, but with a design for a cubist, significantly smaller building. In 1972, before the subsequent planning phase even ended, the bank realised that it would need more space than originally specified. Furthermore, the client had very specific ideas concerning the building’s economic efficiency, flexibility and long-term use. It should enable a variety of individual and open-plan offices, with maximum flexibility as well as daylight in every office – ideally with a view for every employee. This gave rise to the idea of taking a completely new approach: A literally “outstanding” tower, something spectacular and unprecedented. “The building was designed to demonstrate the vibrancy of architecture,” says Oliver Betz, CEO of Betz Architekten, looking back. The eaves height in Munich (with the exception of the television tower) had previously been limited to 99 metres, so that the towers of the city’s Frauenkirche (Church of our Lady), would remain the highest points in the city’s skyline. Betz designed a 114-metre building – any lower and the sculptural profile and proportions would not have had the desired effect. “The then city administration under Mayor Georg Kronawitter reviewed the model, were convinced and approved it,” Betz recounts. In return, Hypo-Bank agreed to cover the cost of the section of the new underground railway to Arabellapark. In 1974 a foundation pit the size of three football fields was excavated and the foundation, which was 26 metres thick and would need to support a 275,000-tonne building, was cast. The four stair towers were erected up to the tenth storey, reaching a height of 42 metres, above which a load-bearing frame weighing 3,800 tons gradually rose heavenwards with the help of 13 hydraulic presses. The floors above this are borne by the load-bearing frame, those below it are suspended from it, in order to keep the column cross-sections low and economical. The construction of the underground was also a technical and structural engineering challenge. Not only was this the first time that an underground tunnel was being built directly under a new building, but it was also necessary to prevent the foundations of the two buildings from coming into contact anywhere, meaning that a solid reinforced concrete frame was built to separate the tunnel from the building. Instead of the usual solid square or round tower block, with limited flexibility due to its central core, the architects built a sculptured, extroverted building on stilts. The client’s stipulations of lots of daylight in the workplace and maximum versatility in terms of office layout were met by the layout of the floor plan and a large façade surface area. Walther and Bea Betz lifted the structure over the base into the Munich sky on four pylons of varying height, giving the high-rise building a decidedly light and airy feel despite its uniform, closed skin, as if it had been released from its weight and mass,(2) The windows and aluminium panels on the façade share the same silver hue and reflect the colours of the sky, so that the building’s appearance changes with the weather and the seasons and blends in with its surroundings, rather than being an intrusive foreign object. So the shapes of the base construction and the tapering floors above it, which at first glance appear capricious, were actually designed to facilitate the function of the offices behind the façade (3) and ‘are still just as up-to-date and modern as they were when construction began’, says Oliver Betz. To this day, the tower is a significant part of the Hypo-Vereinsbank identity. For the people of Munich it has become a modern-day monument, a building that reflects the aesthetics of the ‘80s in a way that is unique and remains contemporary to this day.